Very interesting article, I have just started taking a digestive supplement, which contains 100mg Betaine HCL. After reading this, I was wondering if this should or shouldnt be taken? I have been very ill in the past and realised it was dairy wheat and sugar giving me problems. I then discovered I had candida overgrowth. After having a dream (I know it sounds weird!) it came to me that the problem was low stomach acid or lack of digestive enzymes. I really want to do this properly, will correct amounts and times. Any advice would be very much appreciated! A Ketogenic diet has helped many people lose that midsection/weight and become healthier overall. First you must make sure you are digesting your foods! Digestive enzymes first and foremost. If you are over 50 maybe Hdrochloric acid/betaine would help (after meals - 30-60 mins). Follow Jon Barrons Baseline of Health protocol and eat healthy, natural foods (avoid factory farmed meats and go for grass fed and free range products instead). Lots of veges (omit most carbs and sugars until you lose the weight and then stick to healthier/ancient grains (sprouted), and organic low glycemic carbs. Thank you for a very informative desssertation of digestive enyzmes. I recently began doing a study on this and I'm sharing it with my friends. Thanks again! While it is unusual for someone as young as 13 to need enzymes, it is not unheard. 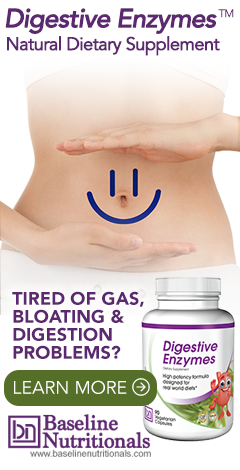 A good well rounded plant based digestive enzyme is the Enriching Gifts Plant Enzyme. It is quite possible that a child under 13 would need digestive enzyme support – if that child is eating the typical diet of cooked and processed food. Heck, children are now suffering from high blood pressure and “adult” onset diabetes. Your friend should check with her daughter’s pediatrician for a recommendation on whether or not supplementing with digestive enzymes makes sense. I would read Jon Barron's entire series on enzymes here: http://www.jonbarron.org/enzymes/proteolytic-digestive-enzyme-formulas And Jon Barron's formula recommendations are listed here. What a bunch of non-sense! A look at any human physiology textbook can tell anyone willing to lissen that the information on this page is a collection of theories that have no support in credible science. Thank you for your comments. I know they will come as a complete surprise to the millions of people worldwide who have supplemented with digestive enzymes and proteolytic enzymes over the past 30 years. And to think, those people thought they were actually receiving demonstrable benefits – and now to learn that those benefits are not credible! They will certainly be disappointed. Even more amazing, though, is all those people who were fooled into thinking that digestive enzymes could actually demonstrate an ability to break down oatmeal in a matter of minutes – when they ran their own tests. But then again, what are you going to believe – what you experience with your own senses, or what someone writes in a text book. But that’s not even a question, is it? Obviously you have never tried it. I am a scientist. Before all I could eat was fruits and vegetables if I didn't want an energy crash after eating. Now taking a digestive enzyme supplement I can eat whatever I want again and feel great and have lost weight. The proof is in the pudding. Marcus - I have had chronic fatigue for 15 years. I've developed food allergies over the last 4 where I can fall asleep in a deep narcoleptic type coma for hours depending on the 'offending' food like corn, dairy, grains. It's gotten so bad I can hardly eat anything. Without saying too much I did a cleanse type thing and after that my health went downhill. I cannot work anymore and want to so badly. My elderly dad is taking care of me and he's scared to death about my health. I have lots of inflammation and just started reading enzymes tonight and found this post and your comment. Is there a certain one that you take that you like? Brand and specific formula if they make more than one, please. Thank you for any help! God bless you. Your response to the overview of enzyme activity is far less convincing. Nothing in this article is contrary to human physiology. There is over 20 years of human clinical studies validating the use of enzymes with human health. Are you advocating the use of a patented pharmaceutical drug that further harms the patient, and only benefits the pharmaceutical company? Is this what you are calling proven science? I suggest you spend some additional time studying nutrition. Hi Dr. Roman Pawlak. I started taking digestive enzymes just about a month ago because of pretty bad constipation for which nothing particularly helped. From the very next day, the very bad pain (from haemorrhoids) was completely gone. I was amazed as I had suffered from this complaint for a long time. Another thing I noticed was that I now no longer experience tooth or gum discomfort. I have always had to take particular care as respects my diet because I have been constantly troubled by swelling/bleeding gums, despite great care with dental hygiene. So, I decided to do some research into other possible benefits of digestive enzymes, as I could think of nothing else that may have brought these changes about. I'm absolutely sure that it is the enzymes as I have never before experienced results such as complete reversal of painful constipation and, on top of that, no more painful teeth/gums. That's good enough for me. I'm convinced. Dr. Polak, what would you suggest, because my stomach and throat are in bad condition now. My stomach feels like it's on fire! My throat feels raw, but thankfully, I don't have lesions yet. The acid from my stomach is coming up into my throat and if this isn't an indication of a serious digestive problem, I don't know what is. At this point, I'm desparate! And (Listen)! I know this condition is caused from not eating right, but I need a quick remedy to relieve the symptoms I'm having. I think digestive enzymes are the way to go at this point. I also read that digestive problems are a break-down of the immune system and this can only be caused by improper eating habits. Why are most Americans taking antacids! Hi Carla. I know that your comment was over two years ago, but I still hope that you get notified that I responded, and that you will respond to me. My question to you is: Did you get on the digestive enzymes, and if so then how have they worked in resolving your GERD / acid reflux? Also, are there other things you have done that helped? I am very interested in your progress, so would appreciate details. I ask because my doctor clinically diagnosed me with GERD / acid reflux in July 2014, and he put me on a proton pump inhibitor (PPI) called Pantoprazole, which is generic for Protonix, and he also put me on a drug called Sucralfate (generic for Carafate) for the purpose of coating the stomach. To tell the truth, the drugs are not helping me as much as I would like. I have been reading a lot on the internet about GERD / acid reflux, and ALL of the many methods that people claim they have cured it. I also read several articles by Jon Barron, and am truly impressed with his knowledge on this subject. So, I am putting a lot of hope in digestive enzymes that they will permanently & totally cure my GERD / acid reflux, and that I can get off of the pharmaceutical drugs. Thank you. Hi Mark. I'm the same as you. Did the Enzymes help. Looking forward to your reply. It's very difficult to take someone seriously when they can't spell at the third grade level. Why put yourself out there if you're going to look stupid? You sound arrogant and also you can't spell at grade 3 level as the word listen is misspelt as" lissen " in your previous post. Have you heard of spell check? Dear Doctor--perhaps your doctorate is not in medicine. Seems like one would need a text book in endocrinology and others besides your recommended textbook in anatomy. I am not a highly educated individual, but one suggestion might be that when you listen to someone it should be genuine listening and not lissen. Maybe it's you who should "LISSEN" (sic), you supposed graduate of pharma-funded institution of biases. Thanks, great info. When the shipping of fresh food became vogue, guess what was used to forestall spoilage? Salicylic acid--aspirin. In looking at pre history and the strange cult of the earth mother deified by the Venus of Vilendorf figurines, I have come to the conclusion that at the 20,000 y point when the climate turned frigid in Europe, meat eating was the only way to survive. This almost exclusive diet of meat destroyed female fertility. The carved figurines were a plea for restored fertility as the child bearing age women were treated to the most food. It actually had the opposite effect. I have read that cooking was needed as raw meat digestion required a gut we do not have. But this is always in reference to the European ice time. Cooking would have been necessary there. Would there have been any available enzyme say in the gut of the dead animals? Is that why pre humans at the contents of the animal's gut? Pineapple of course is tropical. All of the pre human settlements are north of the Equator, particularly in Europe, as the site for beginning agriculture. I have developed a theory that says the seas suffered a colossal failure of fertility. Without sea food, the pre humans were forced to eat meat. The question arises as to why Europe and Asia were so thickly populated as to force a search for protein. Could it be they were actually equatorial which would allow for the papaya and pineapple and other forms of enzymes in ready to eat forms. Was there 20,000 y ago an axial change? A quick question: Just to confirm it's safe to take both proteolytic enzymes with digestive enzymes? I was looking for info on proteolytic enzymes to help with chronic inflammation / joint issues, but after reading this I'm also interested in the digestive enzymes as well, as I've been taking prilosec continually for 8 years and I think this may be a better solution. For more information on the formulas Jon Barron recommends, just click on the products link above and scroll down to read more information and where to buy.